The general picture to have emerged from the Ulysses data regarding the global, 3-dimensional structure of the solar wind at, or near, solar minimum is that the high latitude solar wind originating from the polar coronal holes is characterized by a fast, uniform flow, with an average speed of 750 kms-1. Slow to medium speed wind streams originating in the coronal streamer belt are confined to a relatively narrow range of latitudes on either side of the heliographic equator. This band, in which the majority of solar wind variability is observed, also contains the heliospheric current sheet (HCS) that separates the oppositely directed large-scale magnetic fields originating in the two hemispheres. 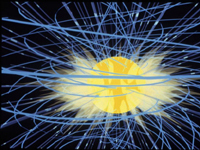 Although the streamer belt and HCS are approximately aligned with the heliographic equator at solar minimum, they both exhibit significant warping, thereby allowing stream interactions to occur. At the time Ulysses made its rapid pole-to-pole passage in 1994/95, the band of solar wind variability at the position of the spacecraft (1.4 AU) occupied some 43 degrees in latitude, from -22° to +21°. The region was noticeably narrower compared with situation in 1993 when the spacecraft left the slow to medium solar wind at -35° latitude on its way to the south polar regions, consistent with the evolution of the streamer belt towards solar minimum. In addition to its higher average speed, the solar wind at high latitudes has higher proton temperature and momentum flux than low-latitude solar wind, but lower average number density. Another key result from the first Ulysses polar passes concerns the global structure of the heliospheric magnetic field. Ulysses observations have revealed that the radial component of the magnetic field is latitude-independent, contrary to the majority of model predictions. This result implies that the HCS is the dominant factor in determining the radial field at the orbit of Ulysses, rather than the solar field at the poles.